The number of improving housing markets continued to expand for a third consecutive month in November, rising from 23 to 30 on the latest NAHB/First American Improving Markets Index. . The list dropped two metros and added nine new ones — Cheyenne, Wyo. ; Corpus Christi, Tex. ; Davenport, Iowa. ; Fort Collins, Colo.; Hinesville, Ga.; Lima, Ohio; Monroe, La. ; Tyler, Tex. ; and Williamsport, Pa. The two metros that dropped off of the improving markets list in November were Iowa City and Wichita Falls. These metros experienced declines in their employment and permit data, respectively. The IMI is designed to track housing markets throughout the country that are showing signs of improving economic health. The index measures three sets of independent monthly data to get a mark on the top improving Metropolitan Statistical Areas. The three indicators that are analyzed are employment growth from the Bureau of Labor Statistics, house price appreciation from Freddie Mac, and single-family housing permit growth from the U.S. Census Bureau. 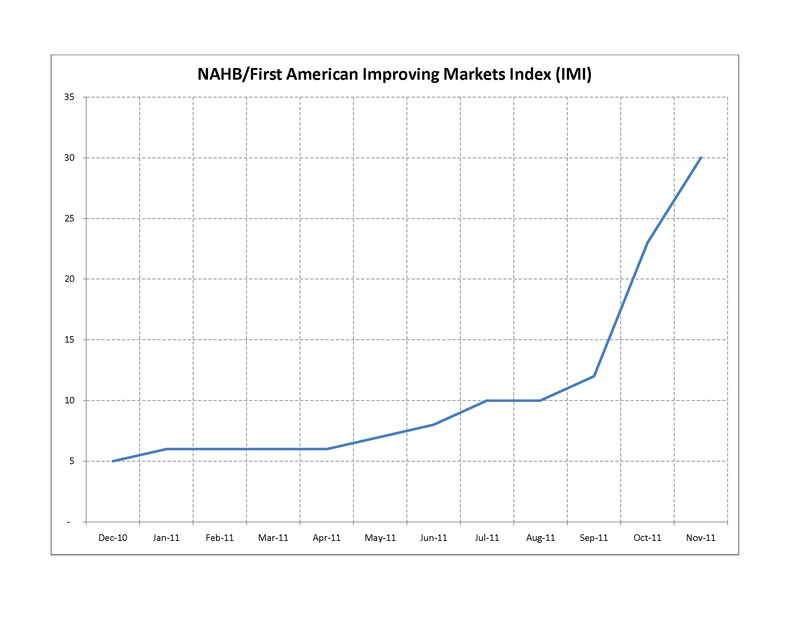 NAHB uses the latest available data from these sources to generate a list of improving markets. A metro area must see improvement in all three areas for at least six months following their respective troughs before being included on the improving markets list.